How to Root Right Samsung Galaxy A5 SM-A500F Running Lollipop 5.0.2 – These are complete guide to root Samsung Galaxy A5 SM-A500F running Android 5.0.2 Lollipop, method we gone use for this guide is using Odin. If your device already received Android 5.0.2 Lollipop update, then you can use this guide to root your Galaxy A5. Before starting to following this guide i must warm you that rooting device have some risk, losing data because accident delete, warranty void, tripping KNOX and the most biggest risk is brick your Samsung Galaxy A5. So please very consider before starting to following this guide. Samsung USB Driver ↦ Usb driver for Samsung device, if you already installed KIES on your computer than this download can be ignore. Odin3 v1.85 ↦ Odin than can be use to flash root application and binary SU to your device, recommended to use this version only. CF-Auto-Root ↦ Root application and binary SU than need to install to your device. Install Samsung USB Driver on your computer and make sure it completely work. Run Odin3 v1.85.exe, and leave it open on your desktop. 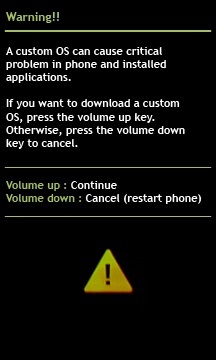 On Download Mode windows press Volume Up and then connect your device to computer. Done, now you can disconnect your device. Open applications menu and find SuperSu application, to confirm that your already successful rooted install root checker from Google Play Store.